We’re the UK’s leading projector screen specialist. Whether you’re looking for a Fixed Frame Screen for your home cinema or an Electric projector screen for your office, we’re here to help. Since 2001, we’ve helped over 50,000 customers find their perfect projector screen. Whilst you can project your image on to a flat white surface such as a wall, the vast majority of the brightness and vibrancy will be lost. Below we have broken down projector screens in to the most popular types purchased by our customers. Click on the type most relevant and we will show you the best brands and ranges all at the very best prices. Lower and raise your screen at the press of a button. Available in a range of formats and sizes. Colour fidelity. Image uniformity. Pixel Preservation. The enthusiast’s choice for a dedicated application. The ultimate screen for a superior flat image at all times. 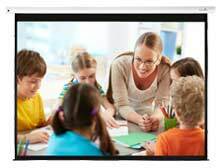 Do you need an Electric Widescreen Projector Screen? Perhaps a Fixed Frame Video Format Projector Screen or Portable Projector Screen. Do you need in-ceiling or on wall? With all these choices available, here at ProjectorPoint, we understand if you are new to Projectors or Projector Screens selecting the correct screen can be a bit daunting. We are experts in projection screens, if you are having trouble in choosing the right screen or can't see the one you need listed just drop us an email or give us a call. Don't forget to check out our Projector Screen advice guide which will give you all the info you need to select the right screen for environment.